Infinity is over, so Jonathan Hickman and Salvador Larroca can let the Avengers just sit back and relax right? Nope, there are still potential global killing problems to face. And Steve Rogers and Tony Stark are reviewing if the team has the right mix. It is kind of like Avenger draft day. Oh, and is that a dead Avenger? With the Builder fleet and the Thanos invasion defeated, the Avengers look to the future. Or actually the future comes to them through Iron Man 3030 who attempts to fix the future by helping the Avengers today. Because the multiverse is dying Agents and Earth 616 is at the center of it all. And the 616 is visited by travelers from other universes, including a group of Avengers who may not be the heroes of our world. And there is a dead Avenger for S.H.I.E.L.D. to investigate. A.I.M. lets loose a group of explorer Adaptoids into the Multiverse to steal resources from other universes. But they may have plans of their own. And the reader discovers that the Adaptoids have a shocking connection to the Earth incursions. And someone might be onto the Illumanti and could expose their globe saving efforts. The Avengers face a group of Avengers from a world doomed by an incursion event. These events have been going on for quite some time in New Avengers, where the Illuminati have made the horrible choices needed to save Earth 616. This new group of Avengers has not tried to save their world. No they have fled it. And it is admittedly it is a little fun to see this group with its slight changes. For example, Captain America has a different rank. And Iron Man is not Tony Stark! It is a what if been Avengers that is really interesting to read about. Bruce Banner is a big part of this story. And he is dismayed by the actions of Tony Stark. And upset by the actions of the alternate Avengers and what it could have meant for him. What if the 616 Avengers have considered treating him the same way his doppelganger teammates did? My favorite moment is one that will tickle the hearts of a Marvel Cinematic Universe fan, he does not like Gods. He states, “See a god, punch a god.” It is a great moment that makes you think these Avengers could be the same as those on the big screen. It is time to review the Avengers. Is the Avengers Machine the right mix? The designers Captain America and Iron Man review what they have done, though one is less rigid with the formula than the other. Wolverine is out! He is going to die after all! He is not healthy and has other priorities. And Spider-Man is out, because he is erratic…he’s not Peter Parker! And some that might have been considered villains in the past like Starbrand make the cut. But one thing is certain; Cap is sticking to the concept that big problems need big solutions. So he will continue to lead a big Avengers. After all, they did fight off two invasions at once! So the plan must be working. I feel bad. I do not have a lot to say about Avengers: Adapt or Die. It really feels like the middle of a story. In this case the Earth incursions from New Avengers are becoming prominent in a number of Avengers titles. 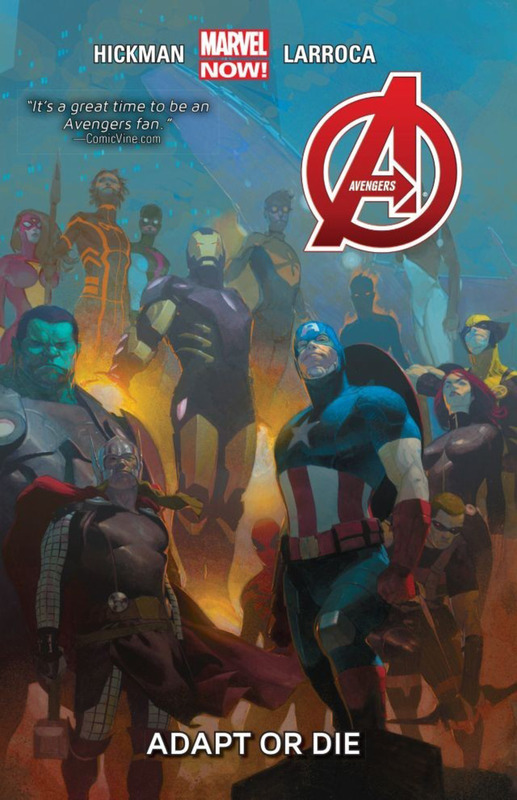 Big things are brewing, and this volume gets Avengers’ readers up to date with some events that have been occurring in other titles. But this volume really is the bridge between what has happened and what will be.